If you are building or remodeling a commercial restroom, choose a company you can trust like Robert Brooke & Associates. We have over 48 years of experience selling top-of-the-line commercial hardware products to businesses, universities, churches, and more all over the globe. Robert Brooke & Associates sells high-quality plastic laminate toilet partitions at unbeatable prices. 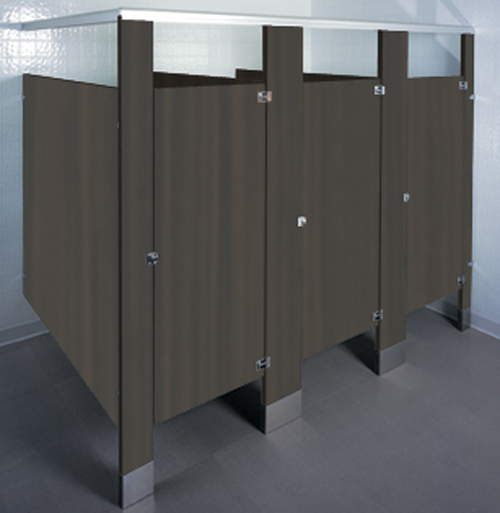 Plastic Laminate partitions are a very affordable yet durable option for your commercial restroom. The finish is resistant to cosmetic damage and is available in many colors. For your plastic laminate toilet partition and other commercial restroom needs, be sure to invest in the experts at Robert Brooke & Associates. Plastic laminate bathroom partitions use particleboard for the core with an outside layer of laminate by Formica or Wilsonart on all sides of a sheet. Moisture guard plastic laminate helps with delaminating, however, we do not recommend using these stalls in shower areas as this product will delaminate over time due to water. This product is the second least inexpensive toilet partition on the market and is often used within churches, commercial businesses, and office buildings. Plastic laminate has thousands of different laminates available and offers such as wood grain, a stone look, marble, solid colors, and many more. Most plastic laminate toilet partition manufacturers provide a warranty of 5 years, however, the toilet partitions will last up to 20+ years if properly maintained. Robert Brooke has been a trusted name in the commercial toilet partition business for over 48 years. We’re eager to help with the configuration, selection, and purchase of plastic laminate toilet partitions.